Pandora The World of Avatar – What you need to know! If you are heading to Walt Disney World, you will not want to miss the newest land, Pandora The World of Avatar that recently opened in Disney’s Animal Kingdom Park on May 27, 2017. The addition of Pandora turns Animal Kingdom into a full day experience that will keep the crowds coming for many years to come. Pandora is a moon planet from the movie, Avatar, with influence from the director James Cameron, who had significant input into the creation of Pandora in Animal Kingdom Park. While it is not necessary to watch the movie Avatar to enjoy Pandora, the movie can provide some background into the Na’vi culture and traditions that make everything in Pandora a little bit more familiar. The back story of the new land is that Pandora is set 100 years in the future from the end of the movie. Pandora itself had been ravaged and much of the planet had been destroyed. But with proper care and maintenance to their ecosystem, Pandora has been restored to its natural beauty and visitors are now able to visit Pandora via Alpha Centruri Expeditions (ACE), who will take you to the Valley of Mo’ara. Fly on the back of a banshee with Avatar Flight of Passage, take a boat ride along a Pandoran river, walk under the Hallelujah Floating Mountains and enjoy food and drink from Pandora. Visit Pandora has all the details! There are two attractions in Pandora – The Na’vi River Journey and Avatar Flight of Passage. Journey down a Pandoran River with the Na’vi River Journey, a river boat ride exploring the bioluminescent forest taking you to the Na’vi Shaman of Songs, revered for her personal connection to Pandora through her music. Avatar Flight of Passage is the flagship attraction, where guests can sit on the back of a banshee, linked to an avatar who is already in flight to experience the rite of passage of connecting with a banshee and taking your first flight. Fast Passes are available for both, however they are tiered so that you cannot hold a Fast Pass for both rides on the same day. So if you have to choose one, I highly recommend Flight of Passage. Definitely get a Fast Pass for that one. Wait times will be long for this ride but it is definitely worth the experience! The Na’vi River Journey is a faster loading attraction so it moves quickly and the wait times will not be as long as Flight of Passage. Take the time to explore Pandora. Much attention has been paid to the re-creation of the moon planet and no detail is spared. The attention to detail is absolutely breathtaking! Try the Night Blossom drink and the Pineapple Lumpia, signature snacks and beverages from Pongu Pongu, a quick service beverage stand run by an expat that travelled to Pandora and didn’t want to leave. The Night Blossom drink glows in the dark and the popping boba bubbles explode in your mouth! Windtraders – souvenir store with a variety of unique souvenirs only found in Pandora. Here you can get a custom made avatar of yourself. Also in Windtraders is The Rookery. Guests can choose an interactive banshee, with the help of a Naturalist from the Alpha Centruri Expedition crew. They assist with “connecting” you with a banshee and identifying the right one to adopt as your own. With ten different breeds to choose from, there is an interactive banshee for everyone. Once you make the connection with your banshee, it is yours for life. Take advantage of “Extra” Extra Magic Hours. Originally only until July 5, 2017, “Extra” Extra Magic Hours are exclusively available to Disney Resort onsite hotel guests who will have the opportunity to enjoy Pandora through August 19, 2017 with after hours access from 10:00pm to midnight from July 5, 2017 to August 19, 2017. For the early morning risers, head to Animal Kingdom Park for Extra Magic Hours in the morning and ride the attractions for 1 hour before the park opens to the public! With early morning opening hours at 8:00am, you will want to be at the parks before 8:00am to get to the attractions early to minimize your wait time! Visit Pandora after dusk. Pandora comes alive with its bioluminescence beauty and is a completely different experience than visiting Pandora during the day. Satu’li Canteen – build your own bowl with a protein, base and sauce, and enjoy steamed Pandora pods (their variation on burgers). Pre-order your meal through the My Disney Experience app to skip the lines. 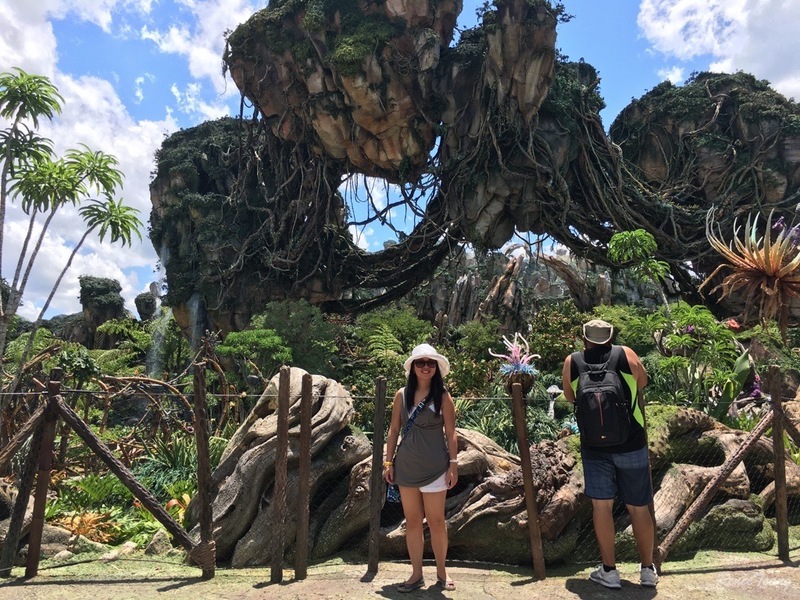 If you want to read about our personal adventures to Walt Disney World and Pandora, check out my blog post, “Exploring Pandora with a Whirlwind Weekend Trip to Walt Disney World“. If you are interested in visiting Pandora yourself, let me know how I can help! 2018 Walt Disney World packages were just released in June so now is the perfect time to reserve your vacation package so you can begin your Disney World vacation planning immediately! Contact me today!